The California Department of Transportation is commonly termed as Caltrans. The department overviews the entire transportation network of the state of California. California’s vast terrain and varied topography are connected by a comprehensive transportation system. Caltrans administers and manages the state’s highways, freeways, railways, airports, and hospital heliports. Caltrans implemented six primary programs to improve accessibility and convenient mobility with cities across California and also with neighboring states. The programs include Mass Transportation, Aeronautics, Highway Transportation, Transportation Planning, Administration and the Equipment Service Center. California is also famous for its car culture and consequently the state faces unwanted traffic congestion. The transportation system in California comprises of the roadways, airways, railways and the waterways. The road transportation in California mainly comprises of the controlled-access highways, limited-accessed highways or expressways and the highways. Caltrans has implemented many plans to improve the roads of California and numerous road construction projects are going on in full swing. The roads in California suffered some drawbacks due to varied terrain and the fast growing population. Listed below are some important plans and programs implemented to ensure road safety and better connectivity. Caltrans Maintenance Program: Manages pavement, rehabilitation and maintenance. Roadside maintenance: To maintain and manage roadways landscaping, vegetation control and roadside rest areas. Photolog: Allows drivers to take a virtual drive along any California highway. Tell CHP: Toll-free number to contact the CHP on non-emergency calls. The Adopt-A-Highway-Program provides a great opportunity for individuals, organizations, or businesses to help maintain roadsides cleanliness of all roads within California’s State Highway System and also plant trees or wildflowers, and help remove graffiti, to make roads more appealing. The program is a successful government-public partnership program which was launched in 1989 . Various schools, social groups, business entities and religious groups actively adopt and participate in the program. For any queries or information about Adopt-A-Highway Program, please contact the regional coordinators listed below. The Mile Marker is a program that overviews caltrans performances and workings. The Mile Marker manages the performance data including worker safety, airport safety inspections, LED fixtures, on work-related injuries, illnesses, and fatalities, pavement health, Amtrak California, project delivery, vehicle detector health, and bridge health. The main mission and goal of the scenic highway program is to safeguard and improve the natural scenic beauty of the highways of California including its adjacent corridors. The program adopts a special conservation treatment to protect the roads and all the corridors from encroachment such as junkyards, dumps, concrete plants, and gravel pits, proper landscaping or screening, prohibit billboards and graffiti , environmental friendly developments, regulate grading to prevent erosion alteration in contours, preserve important vegetative, hillsides, provide a local transportation vehicle to promote local tourism. The Complete Street Program is a very practical program that has been implemented to ensure safe and convenient mobility of all people using various modes of transportation including pedestrians,bicyclists, transit vehicles, truckers, and motorists. The program functions according to the respective community's preferences, road travelers and their needs. The program includes many action plans such as Complete Streets Overview Training Course of the Caltrans staff, collecting complete streets data and performance measures, the development of a State Bicycle and Pedestrian Plan,and supporting District complete street plans and partnerships. The program has been successfully accomplishing its mission and the benefits of the program include increased Transportation Choices, Economic Revitalization, Greenhouse Gas Reduction and improved Air Quality, improved Infrastructure Investments, improved Safety for all users, promote Walking and Bicycling to improve Public Health, . The Bicycle Program implemented by the Bicycle Facilities Unit has its mission to protect and improve safety and comfort of the bicyclists through the unit’s practical policy, funding, and technical resources in bicycle transportation. California has several bike routes, including the Los Angeles River bicycle path in the Greater Los Angeles Area, and the San Francisco Bay Trail in the San Francisco Bay Area. The bicycle facilities are divided into three classes. Bike path - The path is a totally separated route from traffic. Bike lane - The lane is particularly assigned for biker in city streets. Bike route - Safe and attractive surface street route designated to bicyclists. The California Highway patrol is the largest and very efficient state police dedicated to ensure road user’s safety and security. The police agency enforces law and authorizes services to anyone commuting within California’s state maintained highways and state properties. The interstate highways of California are I-5, I-8, I-10, I-15, I-40, I-80, I-105, I-110,I-205,I-210,I-215,I-280,I-380, I-405, I-505, I-580, I-605, I-680, I-710,I-780, I-805, I-880 and I-980. Additionally, the United States highways in California include US-6, US-50, US-95, US-97, US-101, US-199 and US-395. I-5: It links the Mexico–United States border at the San Ysidro crossing and cross over into Oregon south of the Medford-Ashland metropolitan area. Some of the major cities it connects are San Diego, Santa Ana, Los Angeles, Stockton, Sacramento, and Redding. I-8: It is a major east-west route that connects east from San Diego to the Imperial Valley before crossing into Arizona west of Yuma. I-10: It connects east from Santa Monica through Los Angeles, San Bernardino, and the Coachella Valley to Arizona. In the greater Los Angeles, it is known as the Santa Monica Freeway and the San Bernardino Freeway. I-15: It connects San Diego to Las Vegas, Nevada. It is a major north–south state highway that operates as the major route from Southern California. I-40: It runs east from Barstow across the Mojave Desert to Needles before entering into Arizona. It is also sometimes referred as the Needles Freeway. I-80: It runs northwest from San Francisco through Sacramento and passes over the Sierra Nevada mountain range before entering into Nevada west of Reno. I-210: It is a major east-west state highway that connects the Golden State Freeway near the Sylmar district of Los Angeles in the west to its eastern terminus at I-10 in Redlands. The Interstate 210 (I-210) and State Route 210 collectively formed the Foothill freeway. The major intercity state route include State Route 1, State Route 41, State Route 46, State Route 49, State Route 58, State Route 99, State Route 152, and State Route 299. Several bus services provide intercity and interstate connectivity. The bus services provide frequent, cheap and convenient services to people from all walks of life. Local bus services are provided by agencies such as the San Francisco Muni, the Orange County Transportation Authority, the San Francisco Bay Area AC Transit, and the San Diego Metropolitan Transit System. Greyhound and Amtrak Thruway Motorcoach provide intercity bus connectivity. Several projects are undergoing in full swing to improve the road conditions of California as to meet the needs of the ever increasing population. Listed below are some major road projects. The Devil’s Slide Tunnels comprise of a separated two lane road and a non separated two lane roads. The separated two-lane road passes over twin bridges and through twin tunnels and extends to connect with the existing non-separated two lane road at each end. The horse shoe shaped tunnels extend beneath San Pedro Mountain from the bridges and north portal to the south portals and from the south portals extends the roadway rejoins Route 1. The tunnels are supported by jet fans to provide ventilation and include lighting, fire protection, and operation and control systems. The Project is stationed just south of the City of Pacifica. The twin bridges are 275 and 300 meters long respectively and the twin tunnels are 1250 meters long  . Initially, California’s routes were marked by the state legislature. But, later, the state legislature re-establishes the entire California state highway system and aligned the legislative route numbers with the signed route numbers. The California state highway codes categorize the highways into different types, including California Freeway and Expressway System, California Scenic Highway System, California Historic Parkway System, Classified Landscaped Freeway, and Blue Star Highways. Some of the notable bridge projects of California are Devil's Slide Bridges, Confusion Hill Bridge, Bixby Creek Bridge, San Francisco-Oakland Bay Bridge, Vincent Thomas Bridge, and San Diego Coronado Bridge. Air transportation is an essential gateway of California that serves the locals and tourists from all over the world. It is the major mode that offers all round efficient and easy connectivity. The Federal Aviation Administration authorizes and oversees all flight operations in California. Listed below are the primary airports of California. Los Angeles International Airport (LAX) is a major hub of Greater Los Angeles area offering efficient transportation services. The airport is located in the southwestern part of Los Angeles. 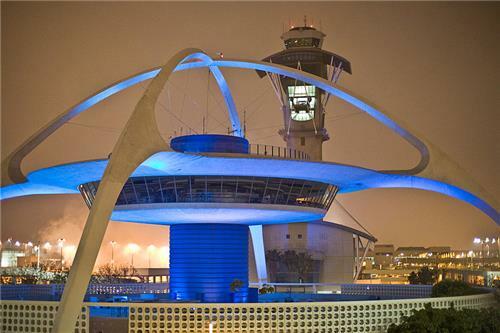 Lax is among the top busiest airports in the world and third in the United States of America. Among the 64 air carriers, some of the major airlines it serves include American Airlines, Delta Air Lines, United Airlines, Alaska Airlines, Horizon Air, Great Lakes Airlines, Southwest Airlines, Virgin America, Allegiant Air, Air New Zealand, Qantas, and Volaris. The airport offers 692 daily flights to 85 domestic cities and 928 weekly nonstop flights to 67 cities in 34 countries . The cargo handling facilities of LAX include Century Cargo Complex, Imperial Complex, and many on the south side of the airport. San Francisco International Airport (SFO) is the second busiest airport in California which is located in the southern part of downtown San Francisco. SFO is owned by the city and county of San Francisco that serves as a major connectivity airport to Europe and Asia. Given below are the major airlines that operate to and from the airport. San Diego International Airport (SAN) is the busiest airport in the United States. It is located in the northwest of downtown San Diego. SAN is a public airport administered by the San Diego County Regional Airport Authority. The major airports that operate to and from SAN include Southwest Airlines, United Airlines, Delta Air Lines, Alaska Airlines, and American Airlines. Also SAN provides connectivity to major cities such as Canada, the United Kingdom, Mexico, and Japan. Sacramento International Airport (SMF) is located in northwest of downtown Sacramento, California. The major airlines that operate to and from SMF are Delta Air Lines - (800) 221.1212, JetBlue-| (800) 538.2583, United Airlines/United Express-(800) 241.6522, and US Airways (800) 428.4322. Sacramento International Airport has non-stop and direct flights throughout North America and connecting flights to almost anywhere including Atlanta, Charlotte, Chicago (Midway), Dallas, Denver, Honolulu, Houston, Las Vegas, Minneapolis, New York (JFK), Ontario, Phoenix, San Diego, San Francisco, Seattle, Washington, D.C. (Dulles). The Rail Transportation is also one of the main transportation modes in California that serves people from all walks of life and also important for cargo transfer. A high speed rail system known as California High-Speed-Rail is an undergoing new project, implemented to improve the intercity and interstate rail connectivity. The Amtrak California trains offer discounts and concessions to seniors above 62 years of age. The main intercity rail service is provided by Amtrak California. Additionally, the Caltrans Division of Rail (DOR) supervises intercity passenger rail services. DOR's main mission is to improve the state’s air quality and reduce highway congestion and fuel consumption. The Capitol Corridor: It connects the San Francisco Bay Area to Sacramento. The Pacific Surfliner: It connects San Diego to San Luis Obispo and runs along the coast of Southern California. The San Joaquin: It connects Sacramento and the Bay Area with the major cities of the Central Valley. The Coast Starlight: The line connects Los Angeles to Seattle, Washington. The Texas Eagle: The line connects Los Angeles to Chicago. The Sunset Limited: The line connects Los Angeles to New Orleans, Louisiana. The major destinations served by Amtrak California include Balboa Park, California Desert, California's Great America, Disneyland, Fisherman's Wharf at Pier 39, Jack London Square, Knott's Berry Farm, Legoland California Resort, Mammoth Lakes (Seasonal), Monterey Bay Aquarium, Old Sacramento, San Diego Zoo, San Francisco Bay Cruise, Santa Cruz Beach Boardwalk, SeaWorld, Six Flags Discovery Kingdom, Six Flags Magic Mountain, Solvang, State Capitol, Universal Studios - Hollywood, Yosemite National Park. Altamont Commuter Express: The Altamont Commuter Express connects San Jose northeast to Stockton, serves from the Silicon Valley to Eastern Alameda County and San Joaquin County. Caltrain: Caltrain connects San Francisco south down the San Francisco Peninsula to the Silicon Valley. COASTER: The San Diego Coast Express Rail (COASTER) connects San Diego north to Oceanside. Metrolink: Metrolink connects Los Angeles, San Diego, Orange, Riverside, San Bernardino and Ventura Counties. California has numerous sea ports which play a vital role in the economic development of the state. California sea ports are the major export and import hub for good movement and distribution across the state, the United States and also around the entire world. There are 11 public ports in California, including 3 mega ports ; 8 smaller ports ; and 1 private port . The Port of Los Angeles and the Long Island port are collectively known as the San Pedro Bay Ports. The San Pedro Bay Ports are ranked the sixth busiest container cargo port in the world. The mega ports of California include Los Angeles, Long Beach, and Oakland and the smaller ports include Hueneme, Humboldt Bay, Redwood City, Richmond, West Sacramento, San Diego, San Francisco, and Stockton. The Port of Long Beach or the Green Port is the second busiest container cargo port in the united States and the 18th busiest in the world. It is located at the south end of the I-710 Freeway, south of downtown Los Angeles. The port is known as the Green port from its effort and policy to decrease and exclude negative environmental impacts. The port is managed by the City of Long Beach (City) Harbor Department. The port is also a major job provider of Long Island, entire state and also throughout the United States. The Port of Los Angeles (POLA) is one of the largest port complex in the nation. The port is busiest container cargo port in the United States and the 16th busiest in the whole world. It is located on San Pedro Bay, south of downtown Los Angeles (LA). The port is maintained and managed by the Board of Harbor Commissioner. POLA is the one of the top employers of the state. It generates major revenue from shipping services and property leasing business. The Port of Oakland is an important international gateway that helps in the economic growth of the region and the state. The port is located in Alameda County on the eastern shore of San Francisco Bay and is controlled by the Oakland Board of Port Commissioners. It also gives great importance to implement innovative environmental programs. The port is a major job provider of the Oakland regions and the state of California and also throughout the U.S. The port provides necessary infrastructure to rapid military deployment and hence the U.S. Department of Defense designated the port as one of the National Strategic Ports. Additionally, it operates and manages Oakland International Airport, commercial real estate (also Jack London Square), and several public parks and conservation areas. The Marine Highway Project which is also known as California Green Trade Corridor is to promote the use of inland waterways for cargo movement and distribution. Transportation Investment Generating Economic Recovery (TIGER ) grant is a federal funding system that provide funds to improve the port facilities and buy the require equipments for container cargo transport. Tiger provides funds to the ports of Oakland, ports of Stockton, and ports of West Sacramento.